Reminder: National K-9 Veteran's Day Event on March 23rd at PetSmart from 12pm - 3pm! 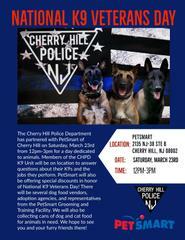 The Cherry Hill Police Department has partnered with PetSmart of Cherry Hill on Saturday March 23rd from 12pm to 3pm for the 2nd Annual National K-9 Veteran's Day event. Members of the CHPD K9 Unit will on location to answer questions about their K9s and the jobs they perform. PetSmart will also be offering special discounts in honor of National K9 Veterans Day! There will be several dog food venders, adoption agencies, and representatives from the PetSmart Grooming and Training Facility. We will also be collecting cans of dog and cat food for animals in need! We hope to see you and your furry friends there!